Rum punch, to the senses. Now we all know I do enjoy rum but I’m no expert and to be honest as I’m just as happy with a bottle Captain Morgan Spiced as I am with a fifteen year old Ron Zapaca. That said I am also very partial to the port finished Foursquare effort which I might actually review, but probably won’t, it was braw. So, today I get this wee sample box in with a lovely attached letter from a whisky swapping buddy, the best kind of buddy, surely? There are two whiskies and a rum, a rum? Yes, a rum, in a whisky sample box sent from a whisky swapping buddy, what dark arts are afoot here I asked myself? 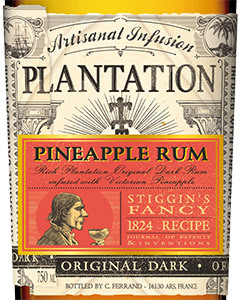 Well, as a curve ball I’ve been sent the Plantation Pineapple Rum bottled at 40% and it’s interesting that’s for sure. I’m not saying it’s bad, yet, but it’s a very different beast from even most of the rums I’ve had. You can read about it’s back story here if you so wish. Nose. Burnt sugar and butter, lots and lots of bananas. Spirit and try and imagine a glue which had a faint whiff of bananas, then you’re with me. Palate. It’s very sweet and sticky in the mouth, lots of banana and pineapple sweets. spirit and really over ripe banana on toast, going back to this I got some over sweet pineapple juice. Finish. A quick finish yes but it leaves a sweet caramel banana taste in the mouth like a banana flavoured toffee but one with a young spirit centre. I’m not sure why this is called a Pineapple Rum seeing as it tastes a lot more like bananas than well, like anything else, yeah there is some pineapple going on but maybe they just thought that Banana Rum would sound disgusting which it would but this decent, I mean it’s not, it’s disgusting, perhaps it’s because it reminds me of the time a mate wrapped bananas and rum in tinfoil and stuck them on a barbecue and they tasted awful the sweetness and spirit of the cheap rum and sludgy banana still gives me nightmares and this drink is basically that in a bottle, but worse. Thanks for the sample, Sam. Previous Stalk and Barrel Single Malt Whisky, and now for something a little bit different.